Of the many differences between our world and our camera’s world, few are more significant than motion. Image stabilization or (better yet) a tripod will reduce or eliminate or photographer-induced motion, but we often make compromises to stop motion in our scene, sacrificing depth of field or introducing noise to shorten the shutter speed enough to freeze the scene. But what’s wrong with letting the motion work for you? While it’s impossible to duplicate the human experience of motion in a static photo, a camera’s ability to record every instant throughout the duration of capture creates an illusion of motion that can also be quite beautiful. Whether it’s stars streaked into parallel arcs by Earth’s rotation, a tumbling cascade blurred to silky white, or a vortex of spinning autumn leaves, your ability to convey the world’s motion with your images is limited only by your imagination and ability to manage your camera’s exposure variables. 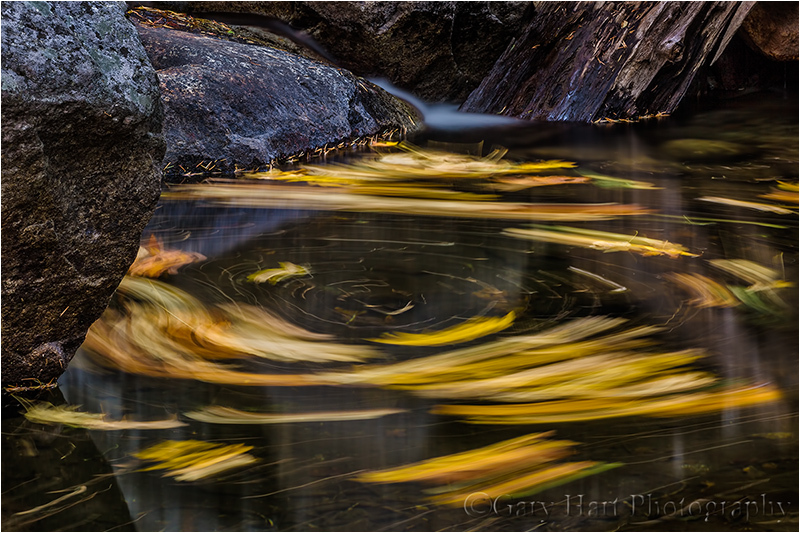 I came across the this little scene in the morning shade beneath Bridalveil Fall in Yosemite. A thin trickle of water entering at the top of the pool, and exiting just out of the frame behind me, was enough to impart an imperceptible clockwise vortex. To my eye, the motion here appeared to be random drift, but I guessed a long exposure might show otherwise. To ensure sharpness from the closest rock all the way back to the cascade, I was already at f22; by dropping my ISO to 100, dialing my polarizer to minimize reflections (thus darkening the scene by two additional stops), in the already low light I achieved a 30-second exposure. The result was an image that recorded the path of each leaf for the duration of my exposure, revealing that what looked like random drift, was indeed organized rotation. Visualizing the way your camera will record motion requires practice—the more you do it, the better you’ll become at seeing as your camera sees. Sometimes you’ll want just the barest hint of movement; other times, lots of movement is best. I usually bracket exposures to cover a broad range of motion—not only does this give me a variety of images to choose from, each click improves my ability to anticipate the effect the next time. Lovely image Gary. All of your images are amazing.